This book has certainly opened my eyes. To deal with the ‘upsides as well as downsides’ point first: yes, there have been times in the past that were much warmer than now, but they came about as a result of gradual temperature changes over millions of years. What we are facing now is a change so sudden that life will not have time to adapt. It is comparable to the great extinction events we find in the geological record, which nearly ended life on the planet. And indeed this really could end up that way. 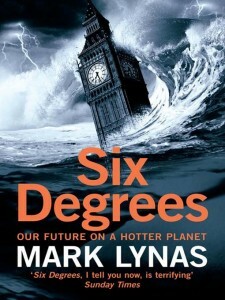 Lynas takes us through six scenarios, from one to six degrees (based on the average increase in the global temperature), and the six degree option is pretty grim reading. Even the one degree option isn’t exactly pretty. Of course, as Lynas repeatedly cautions, the science is inexact. The global weather is an incredibly complex system in which countless different factors interact. We know that meteorologists can’t precisely predict the weather day by day, and clearly they can’t hope to get it exactly right when looking decades into the future. But there is no dispute that increases in greenhouse gases such as carbon dioxide and methane will increase the global temperature, and there is no doubt that human activity has increased the presence of these gases. The details may not all be right, but the overall story is indisputable. And (really!) unless we do something about it, it will have a lot more implications than just things getting a bit hotter. Nor will it just mean events like the loss of the beautiful coral reefs: sad but with little direct impact on our lives. It will mean the inundation of coastal cities, and of huge swathes of land, such as Bangladesh and the coast of China, where hundreds of millions live. It will mean the desertification of much of southern Africa and southern Europe. It will mean more and bigger hurricanes, wreaking destruction over a much wider part of the globe. It will mean positive feedback loops kicking in – the release of methane from newly thawed permafrost, for instance, or the burning of the entire Amazon forest – that will accelerate these kinds of events until they are running away so fast that nothing can stop them. And of course these things will have huge geopolitical consequences: mass migration, wars over land and water, countries defending themselves like fortresses against the desperate beating on their gates. It struck me, reading this, and confronting my own denial (which is like the denial of alcoholics, the denial of rapists, the denial of child abusers, who simply cannot bear to face the harm they do), that if we don’t try and do something about this, it pretty much invalidates any other claim we might wish to make to be doing our bit to make the world a better place. What is the point of working for human rights, if we let the world degenerate into the kind of dog-eat-dog place where human rights are as worthless as paper walls in a hurricane? What is the point of thinking about the needs of developing countries, if we stand by while they become deserts or seas? In fact, never mind these grand public issues, how can we even claim to really care about our own children and grandchildren, if we don’t do anything to stop their world being ruined? The crazy part is that this is all the result of an almighty bonfire we’ve been having, burning up, in a matter of decades, fossil fuels that took millions of years of solar energy to form. And, since the fuel isn’t infinite, it will run out anyway, and the bonfire will end whether we want it to or not. So it’s not even a choice as to whether to stop or not stop the burning. It’s a choice between stopping now, before it is too late, or in a few decades, when it will be. We are gambling the future of our species for the sake of a decade or two of business as usual. I’m going to write more about this. I think there’s a task for science fiction here, a responsibility even. Let’s get back to exploring worlds that could really happen, and move away from writing about starships and galactic empires that we know quite well will never ever come about. Six Degrees on Amazon UK. Six Degrees on Amazon US.